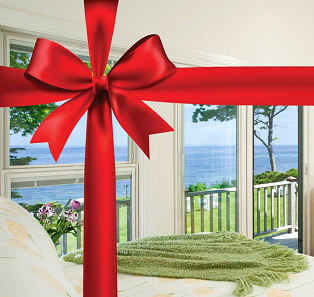 OPEN ALL WINTER Experience the magic of Bar Harbor and Acadia at the Saltair Inn Waterfront Bed & Breakfast located in Bar Harbor, ME. Enjoy our luxurious rooms with king size beds, fireplaces, jacuzzi and claw foot tubs. Come experience the magic of Bar Harbor, Maine and Acadia National Park at The Saltair Inn Waterfront Bed & Breakfast, an elegant in-town Victorian home on the shores of Frenchman Bay. Constructed in 1887 by Boston architect Arthur Rotch, the Saltair has been carefully renovated to accommodate guests while preserving the original architecture and period elements of its Victorian heritage. An expansive back lawn slopes gently from the rear of the house to the water’s edge. Low tide reveals a sand bar connecting the Saltair property to Bar Island, from which Bar Harbor takes its name. Enjoy panoramic ocean views from the privacy of your own intimate suite. Each accommodation offers thoughtful appointments and amenities appreciated by modern travelers without compromising the historic legacy of the home. Rooms have elegant private baths en suite. Standard amenities include luxury bed linens, gas fireplaces (two in each suite), cable TV, CD and DVD players, and wireless internet access. Whether your Bar Harbor escape includes a little romance, peaceful relaxation, or an outdoor adventure, the Saltair Inn offers the perfect setting. Fabulous views, delicious breakfasts, and luxury suites await your arrival.